Our offices are situated in Worton Park on the Yarton Road, half way between Yarnton and Cassington. If you using a sat-nav, our post code OX29 4SU will take you to the Worton Park area, but you will need to carry on a little further down the track as described below. From the A44 heading towards Woodstock, turn left at the first roundabout (you will see SSE on the left). Follow this road along heading straight over at the mini roundabout. Continue past Charlett Tyres on the left. After about a mile there will be a turning on the left with a brown signpost to Worton Park. turn right after 3 miles. Look for the signpost ‘Yarnton 2 miles and Cassington 1/4 mile’. There will also be a brown sign for The Chequers pub. Continue along this road, for about a mile through Cassington and round to the right when the road forks. After 150 yards there will be a track on the left signposted ‘Jericho Farm’ (where our old offices used to be) followed by Cassington Nurseries. Just afterwards there will be the turning to Worton Park on the right. 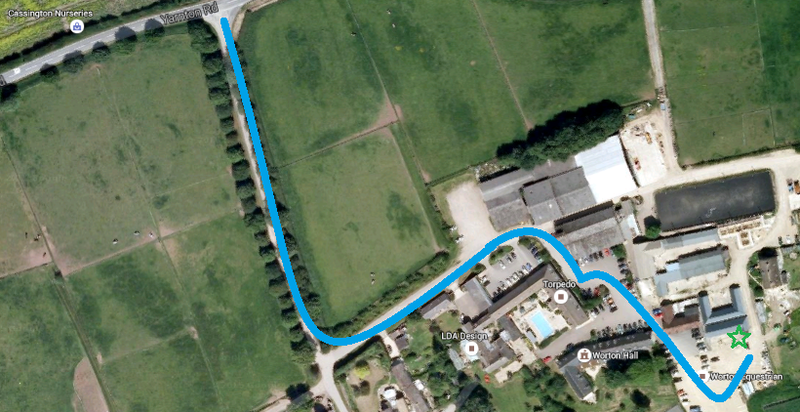 Turn off Yarton Road and follow the track down and around to the left and follow signs for South Car park. The offices are located at the top of the car park, a low cream building with solar panels on the roof.